Welcome to Dodds Christmas Trees Leeds! Do you want a real Christmas Tree this year? Avoid the hassle of transporting your tree home by ordering online and having a perfect Christmas Tree delivered to your door on a day of your choice! We want to make the Christmas period a little easier, leaving you more time to celebrate with your family and friends. We understand the difficulties faced and inconvenience caused by the annual trip out to the shop or local Leeds tree farm to search through the mountains of trees to find one that is fresh, has thick bushes, and a rich green healthy colour. As well as the mess it leaves in your car and having to find time in your already busy schedule, some of the trees, especially in the larger chain shops, are not fresh and begin to dry up, lose their colour and drop their needles, before New Year and sometimes even before Christmas! We would like to help. We promise you healthy fresh trees, collected from the Tree Farm and delivered to your Leeds home or business within 3 days. That means you will receive the freshest and most healthy trees in West Yorkshire, guaranteeing a beautiful tree into January, reducing mess and filling the air with a sweet festive scent. We also understand, the quality, shape and look of the tree also matters to you. Your tree is selected from the top 5% of all trees from a local tree farm. They are chosen for their symmetry, proportions, and colour. If you are not overwhelmed by your tree, we will not be satisfied. If this is the case, let us know. All Christmas trees come with a “quality guarantee” which means if you are not completely satisfied with your tree, we will replace it no questions asked. Just let us know within 2 days of delivery. Free delivery is included with all tree orders. Click here to select your items – ORDER NOW – add them to your cart, then select your delivery day at the checkout. We deliver to all addresses within 30 minutes travel time of LS16. You can calculate your travel time by visiting our delivery page – CHECK TRAVEL TIME. 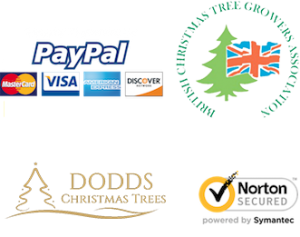 Everything we do is to make your experience of Christmas Tree delivery in Leeds & Harrogate convenient and easy. Simple pricing, ordering online, add optional stands, wreaths, watering funnels and tree collection, select your delivery date, text updates on the day, no nonsense quality guarantee, and tree care instructions provided. We guarantee you the most beautiful trees and the best service you have ever experienced with Christmas tree delivery. Free delivery to Leeds, Pudsey, Wetherby, Ilkley, Guiseley, Shipley, Horforth, Harrogate, Kirkstall, Knaresborough, Headingley, Yeadon, Morley, and Otley (within 30 minutes of LS16).